Mukai is taking on the role of Eisuke, a former bassist of a rock band who gave up his music dreams to carry on the tradition of his family’s French restaurant. The show will involve a love triangle as Kuninaka and Takimoto play rivals for Eisuke’s heart. Kuninaka has been cast as Eisuke’s older girlfriend Maria, who works at a bank. She is shocked to learn that Mukai has abandoned his music to devote himself to the restaurant, leading her to uncertainty about their relationship. Takimoto’s character is a 20-year-old college student named Chie who comes from a farming family. Although she initially had a bad impression of Eisuke, she begins to develop feelings for him after tasting his cooking. 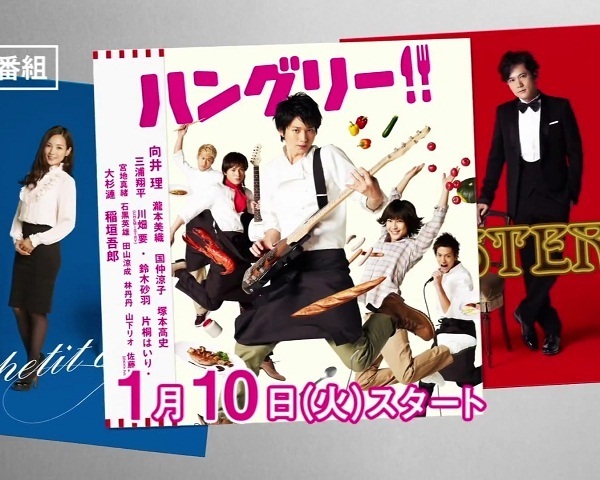 SMAP’s Inagaki will play Tokio, the owner of a competing French restaurant. In the past, he was fond of the restaurant that Eisuke’s mother ran, but after she passed away, he deceived Eisuke’s father and bought out the restaurant’s chefs and staff. Knowing of Eisuke’s ability as a chef, Tokio views him as a rival. Eisuke’s friends, who were part of his band ROCKHEAD, are being played by Tsukamoto (guitarist) and Miura (vocalist). Both of them help Eisuke with his restaurant.